Close Sino-Pakistani relations are not a novel phenomenon. While Pakistan and China’s friendship initially evolved in the context of a geo-strategic framework, in the post-cold war era it has become increasingly multi-dimensional. Chinese economy has also taken massive strides within the globalized world. Chinese foreign policy reflects the importance of economic modernization on China’s developmental agenda. It is a matter of some concern therefore that despite Pakistan and China’s robust relationship in the strategic sector, their economic relationship has not prospered proportionately. China-India trade, on the other hand, is now larger than both trade between China and Pakistan and trade between India and the United States. During the late Cold War period, China may have had slightly different strategic alignments, but today, as a major global power, Beijing profits from regional stability and normal working relations with New Delhi, which not only constitutes the bigger market but also has vast potential within the global economy. The recent handing over of the strategically-located Gwadar port to China by Pakistan is, therefore, an important development as it will place Gwadar on the matrix of intense geo-strategic competition. The port has the potential to act as a catalyst for projects such as the trans-shipment of bulk cargo, oil storage, refinery, petrochemicals, export processing and industrial zones, export of minerals and ship repair industry. When fully functional, it has the potential to benefit many neighbouring and landlocked counties in the region in one way or the other. Changing regional and global dynamics however, render analyses of Pakistan’s future as a bit of a ‘wildcard’. In the worst-case scenario, increased internal violence and instability has the potential to even daunt Pakistan’s strongest ally. Economic relations between China and Pakistan are indeed growing, but must be considered, therefore, in a wider regional and global context. 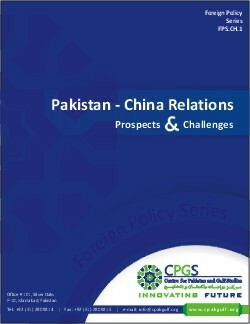 How then should the future of Pakistan-China relations be mapped out in the context of the evolving international scenarios?